Millions will see ethanol brand at Martinsville race this weekend. 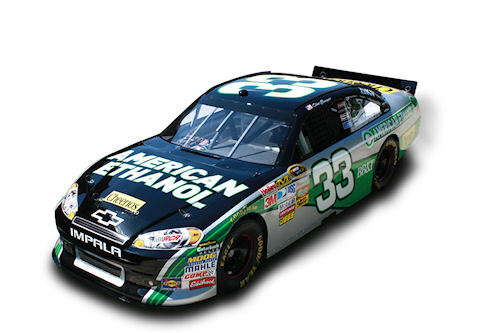 American Ethanol spokesman Clint Bowyer drives the Number 33 Richard Childress Racing Chevrolet in the NASCAR Sprint Cup Series. Following on his recent Talladega win that car will feature a special-edition American Ethanol paint scheme at this weekend's Martinsville Speedway race. As a result, Growth Energy says millions of TV viewers will see the American Ethanol brand. NASCAR is using Sunoco Green E15 racing fuel this season and American Ethanol is partnering with them to promote the nation's homegrown, clean-burning alternative fuel to millions of brand-loyal NASCAR racing fans. This is Clint Bowyer's Number 33 car that will run in Martinsville this weekend. Especially coming off Bowyer's win in Talladega - Growth Energy CEO Tom Buis says the branded race car design will raise American Ethanol's profile in a powerful way. He says the American Ethanol partnership with NASCAR shows fans across the country that ethanol is a safe and viable choice for their cars, that it creates jobs in the U.S., decreases our reliance on foreign oil and improves our environment. In a detailed white paper issued on Sept. 21, NASCAR announced it has accumulated more than a million miles of driving in 2011 on America's toughest proving grounds: the NASCAR Sprint Cup Series, NASCAR Nationwide Series and NASCAR Camping World Truck Series. With more than 1.3 million miles accumulated in practice, qualifying and racing laps in NASCAR racing vehicles, all without incident since the racing season began in February with the Daytona 500, the report demonstrates the performance of mid-level ethanol blends. "We are extremely excited that Bowyer's No. 33 car will prominently feature American Ethanol in this week's race," said National Corn Growers Association NASCAR Advisory Committee Chair Martin Barbre. "Of course, we again congratulate our spokesman on his major victory last week. Now, tens of millions of fans across the country will be keyed into Clint as he again shows the incredible performance of E15 as it fuels him back into victory lane again." Bowyer says he is honored to have American Ethanol on his Number 33 Chevrolet this weekend. He says he supports American farmers as they strive to develop energy independence for the country - and looks forward to representing American Ethanol on and off the track at Martinsville.